Dr. Gilbert was voted Best Veterinarian in Darke County for the 6th year in a row! Darke County Veterinary Service L.L.C. is a full service veterinary clinic and boarding facility dedicated to providing quality healthcare to both small animals and horses in a family oriented atmosphere. We pride ourselves on having state of the art diagnostic equipment and a treatment facility to provide superior care for your pet or horse. Are your pets ready for winter? Call this office today at 937-548-0960 to schedule your pets' appointment today! 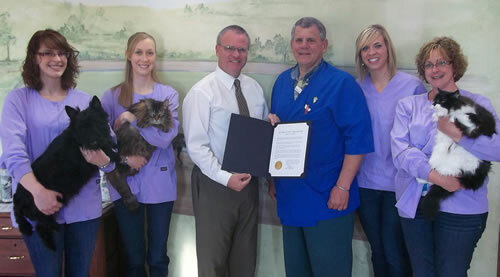 Congratulations to Dr. Gilbert for serving the people and animals of Darke County for 30 years! as a Pillar of the Community!